The Smycms once again delighted their audience with an entertaining trip to the Wild West and the story of Annie Oakley, with a memorable score by Irving Berlin, including such hits as Anything You Can Do, The Girl That I Marry, Doin What Comes Natur’lly and the ultimate showbiz anthem, There’s No Business Like Show Business. This is the story of Annie Oakley, who can’t read or count, but boy can she handle a gun. When The Buffalo Bill Wild West Show arrives in Cincinnati, Annie is persuaded to a shooting contest against the great sharpshooter Frank Butler, before long she is smitten with Frank, though he is not so, as he prefers his women to be feminine – all peaches and cream which Annie clearly aint. Frank surprisingly loses the contest and Annie is invited to join the show. When she becomes star billing, Frank is jealous and leaves to join the rival Pawnee Bill show where he quickly becomes a hit again, but the two shows were having money troubles and the only way to save them would be a merger, but only if Annie and Frank remain as attractions, onlyat the moment they didn’t see eye to eye. However, with the intervention of Chief Sitting Bull, Annie decides to lose the Grand shooting contest to win her man and thus saves the shows. CAST HITS TARGET IN END AFTER MISFIRING FIRST HALF. – Annie Get Your Gun, Church Hill Theatre, ***. Drew Mcadam, Edinburgh Evening News Wed April 6th 2005. “The Whole thing fairly rolled along, hit the high note and sustained it, with Frank (Alistair Thomas) and Annie (Susan D’aish) performing Anything You Can Do. Indeed, you’d have to search far and wide to find better”. 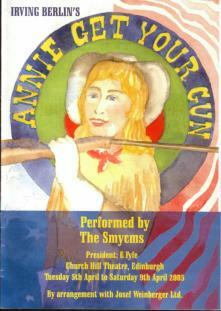 This production of Annie Get Your Gun was the new Broadway revival version, the original stage show had been deemed politically incorrect in its portrayal of the indians and the characterisation of Annie, so the book was revised by Peter Stone to make the show look and sound the way it did to audiences of 1946 with the simple and naive qualities of the original musical being preserved within the contemporary treatment. “This man we call Jerry, as you all know, has been our MD for lots of shows. This man can play a tune, but his timing and tempo would never suit June. His notes mostly similar to what’s in the score, he’d change one or two – and then lots more. Now he’s quittin’ – he’ll be sittin’ and helpin’ his wife with the knittin’. This man we call Jerry we’ll miss good old Jerry you’ll see!”. Artistic Director – Laura Jordan Reed, Musical Director – Jerry Gregson, Choreographer – Janice Bruce. Thanks for sharing excellent informations. Your web-site is so cool. I am impressed by the details that you have on this site. It reveals how nicely you understand this subject. Bookmarked this website page, will come back for extra articles. You, my pal, ROCK! I found simply the information I already searched everywhere and just couldn’t come across. What a great web site.